Goji Food Solutions, improves people’s lives by making food better. 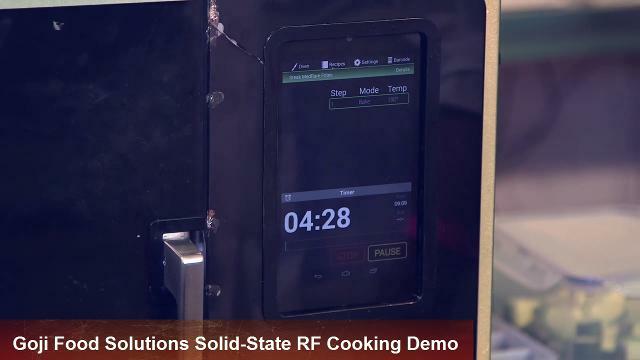 Its pioneering RF cooking technology enables healthier, tastier, faster and simpler food preparation. Cooking high-quality food with consistent results has long been a challenge in both domestic and commercial kitchens due to the shortcomings of conventional heating technologies such as convection and microwave ovens. Food service operators and consumers using conventional cooking technologies are typically forced to compromise on cooking speed, simplicity and quality, resulting in inefficient food service operations or unsatisfying dining experiences at home. Goji has developed a unique RF-based cooking technology which significantly shortens cooking times while improving cooking uniformity and quality, and simplifying the cooking process. Utilizing a high-power solid-state amplifier and proprietary closed-feedback system, Goji RF cooking technology controls the frequency, amplitude and phase of radio waves to provide uniform and consistent cooking results in closed cavity appliances. With over a decade of pioneering R&D efforts and more than 250 patents and patent applications, Goji is the leader in the emerging RF cooking market. Goji RF technology enables faster, better and simpler cooking. Ovens using Goji technology improve back-of-kitchen food service operations by improving food consistency and quality, and reducing waste. At home, Goji enables a significantly better dining experience with nutritious, tasty, high quality meals prepared in a fraction of the time required today and with more ease. By offering a range of tailored solutions, including hardware, algorithm and software, integration, and technical advisory services and IP licensing, Goji is the natural partner for appliance brands and manufacturers seeking to incorporate RF cooking in their products efficiently.